As a genealogist, you’re familiar with the U.S. Decennial Census. The census is most likely one of the first records you searched as a new family historian. But what about those times you can’t find the person you’re looking for in the census? Now what? Sometimes it’s just a matter of thinking about the problem differently. Here are a few ideas to get you started. 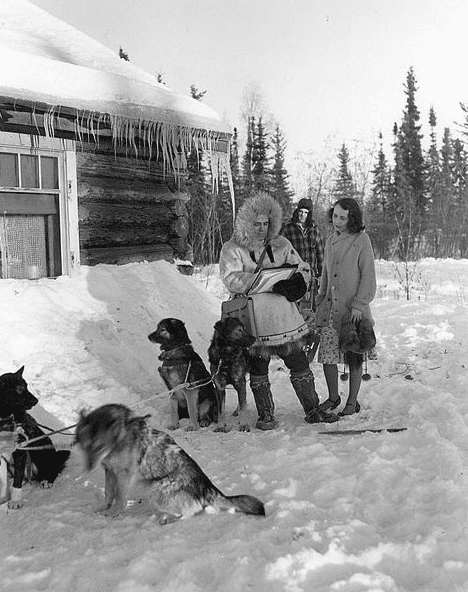 Photo: this 1940 Census publicity photo shows a census worker (left) collecting information from a respondent (right) in Fairbanks, Alaska. The dog musher (center, background) remains out of earshot to maintain confidentiality. Credit: Dwight Hammack, U.S. Bureau of the Census; FDR Presidential Library; Wikimedia Commons. As you fill in the search engine boxes on a genealogy website, it can be tempting to include everything you know about your ancestor: the name of the person, year and place of birth, residence, and names of family members. But that can in some cases be the least effective way to search. By adding all of that information to the search form, you’re essentially telling the website that it should find results that contain all of those dates/names/places. While it may seem like a good idea when searching on a common surname like “Smith,” it’s not the best way to search in general. Searching for an ancestor in the census often means conducting multiple searches. You never know how an ancestor will be listed in a record, and sometimes finding them is not as easy as you would hope. To start, try searching on just a name, birth year and place, and residence. Working with a common surname? How about adding a spouse or a parent’s first name? Someone in the family have a unique first name? Add that. Remember that the information you enter in a search engine box may look very different from what is found on the census. Don’t give up after just one search; try various searches with different amounts of information. Searching for a name can mean more than just entering a first and last name into a search engine. Consider that, for whatever reason, your ancestor’s name may appear very differently than you would expect in the census. For example, initials substituting for first and middle names may have been used as a convenience for the census taker. A stepchild’s surname may be mistakenly listed as the same as the head of household’s. A nickname common to the era, but rarely used today, may have been substituted for a first name. And there can and will be misspellings and errors in indexing due to difficult-to-read handwriting. Also consider the name itself. A surname that starts with Mac or Van may be mis-indexed so that the prefix appears as a middle name, changing the surname completely. As you search for your ancestor in the census, make the most of search engine tools such as wild cards or Soundex (when available). Try variations of your ancestor’s name. Also try to search by just a first name and some identifying information, leaving the surname out completely (works better if the first name isn’t too common). Finally, always read more about the search engine and the website’s collection to get tips for conducting the best search you can. In some cases, you may need to search the census page by page to find the person or family you’re looking for. What’s the benefit of searching the census page by page? Well to begin with, you’re more likely to find something that was mis-transcribed or mis-indexed. However, you need to make sure to stay alert as you search line by line because it’s easy to “zone out” and glance over names, not truly paying attention. Obviously, suggesting going page by page in the census is easier said than done, especially in cases where you are searching a large metropolitan city. BUT I’ve found that doing things the “old fashioned” way we use to, in some cases, can yield the results you need. Census research isn’t always easy. Of course, there’s always the chance that – for whatever reason – your ancestor is simply not there or not where you expect to find them. But incorporating the above tips in your next search can make a difference. A while ago I helped a person looking for a Lithuanian family in Pennsylvania. We found them by looking for all men there aged 20-30 born in Lithuania. Needless to say the names were all bollixed up by the census taker. Same thing with a Jewish family in Albany NY – only “Uncle Joe” with a “normal” English name appeared in the index, and when the census was checked there were the rest of the family. Then there was the time I was looking for Krautwurst and found them a Grundwort – id’d by the address and a city directory! Census research is definitely not always the easiest! We tend to believe it’s simply a matter of typing in a name and hitting the search button but it actually can mean searching each page or being creative with your search. Thanks for providing those tips via your experience! Thanks for the hints! My ancestors seem to use their middle name sometimes, but not always. And in one instance the last name was listed as the first name and the first name as the last. Also one ancestor I could not find no matter how I searched – I used the previous census to find their next door neighbor and then searched for them. Bingo – there was the family! Why they did not show up on any search was a mystery to me. I can’t find my grandfather in 1920, I think he was in the military, maybe overseas. He is still single and is not with his family or anywhere close by. Trying all the tricks I can think of does not bring him up on any search. Still looking for him.